When my “whites” scrap bin was overflowing I decided to make a bunch of blocks using a design idea from ‘Sunday Morning Quilts’, a favorite scrap quilting book. These blocks are fun and relaxing to make. Also, when you choose to work with just one color, it’s hard to go wrong. I like doing this when I’m quilting with scraps to avoid the completely crazy scrappy look. Don’t get me wrong, I like that style too, but sometimes I want something a bit tamer, so I’ll do pinks, or blues and greens, etc. In the end I had enough blocks for two quilts, a lap size and a baby size. I attended a scrap quilt retreat with Cheryl Arkison just this past weekend! !It was super fun! but I definitely have the more crazy scrap quilt thing going on after a day of sewing... 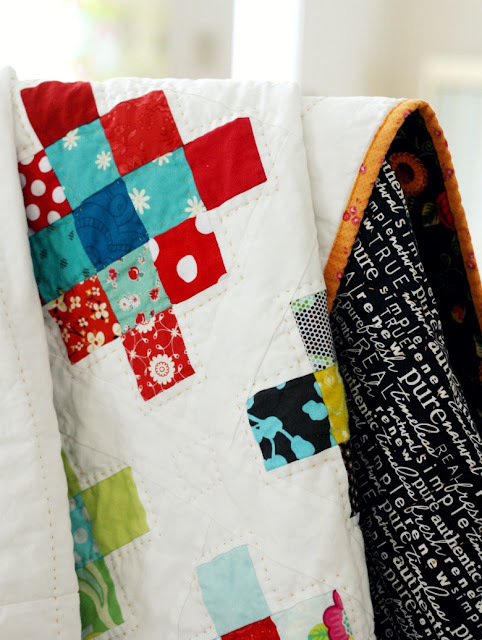 I'm making the candy coated quilt from that book and I'm not in love but in reading about your quilt making experiences I think I might add in alot of one solid and see if I like it better--then my crazy scraps will be more like a feature than overkill. Thanks for sharing your quilts!! These are all so beautiful. I can't say that my low volume fabric is ever overflowing, but maybe changing my shopping habits will help with that. These are so cute and feminine! Both are so pretty. So feminine. LOVE! !